As underwater freedive photographers, we use only ambient light for all our images. At first this was due to practicality, as it is easier to move fluidly in the water without the cumbersome drag of strobes. However, against conventional modes of thought we now prefer to always shoot this way, as using only the natural light available has driven us to be more creative, thoughtful of every frame we capture and has given us a sense of freedom to experiment. Below are five elements that we consider before every frame we shoot. When shooting in ambient light, aim for a strong contrast between your subject, other objects, the background and landscape. There needs to be a strong separation between the subject and the background in order for your image to be striking and for your subject to take center stage and ‘pop’ from your frame. Framing silhouettes against natural backlight is one way to create strong contrast in your images, however it is best to photograph recognizable shapes, such as a person or an animal. 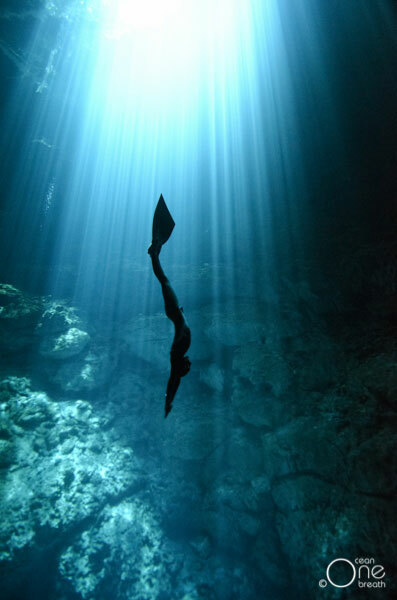 Freediving in the cenotes of the Yucatan, Mexico provided us with a dramatic contrast between sharp rays of light and dark shadows, which allowed us to experiment with silhouettes. However we also discovered that the cathedral light created such a dramatic otherworldly mood that we could play with the sense of place, and we could stage our subjects directly in the strong rays of light. 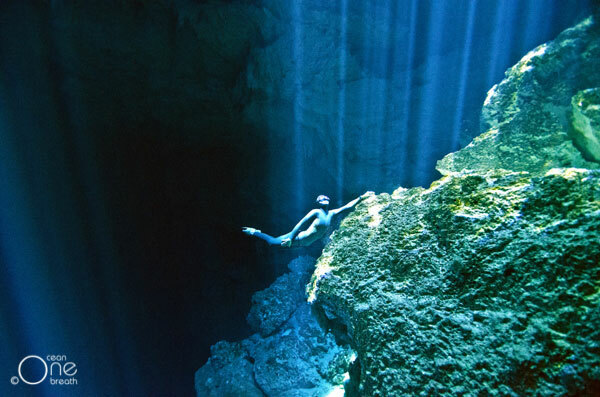 The silhouette of Christina as she freedives to the depths, her black form contrasted against the light limestone background and strong midday sunlight. Christina ascending directly into an ethereal beam of sunlight. The time of day you choose will depict how strong or soft the sunlight will be and the angle in which it enters the water. On bright sunny days, midday light is strong and provides great contrast. There are many ‘rules’ in photography, with one being to always shoot with the sun to your back. But these ‘rules’ were made to be broken! Experiment and don’t be afraid to shoot into the light source as well as at an angle to the source. The results might positively surprise you. Furthermore, afternoon golden light is soft, dappled and dreamy and can help reate for an ethereal mood, which may suit your subject and the concept for your photo shoot. For example, we found the afternoon September rays in Ibiza, Spain to be meditative and silky. 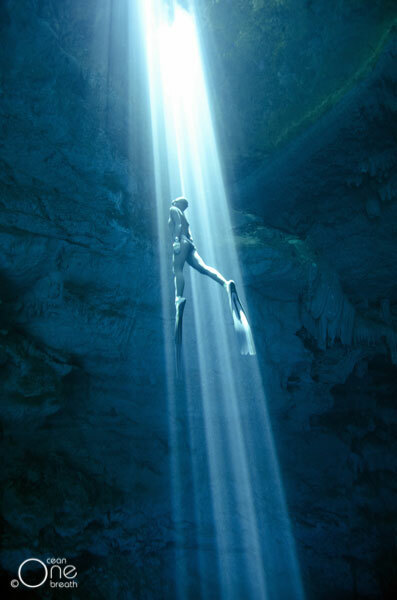 Shooting into the sunlight as Eusebio ascends from a deep freedive. Eusebio in the dappled light of ‘Golden Hour’. Shooting in ambient light means that you are shooting in low-light conditions and the deeper your dive, the less natural light and therefore color of your subjects you have to work with. However don’t fear depth! 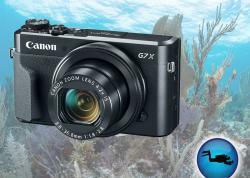 Although it is easier to capture ambient light near the water’s surface or while creating over-unders, you can also shoot at depth while taking care of some technical considerations. Limit the ISO on your camera and know the limitations of your camera’s sensor; the higher the ISO, the greater the chance for ‘noise’ in the image. You also need to evaluate the artistic considerations of your photo shoot including the subject, composition and aims that you have by shooting at depth with the available light. It is best to shoot at depth in waters with very good visibility, which we discovered in the blue marine waters of the Caribbean on the island of Roatan, where we could convey a sense of oceanic depth and emphasize the solitude and minuteness we feel as freedivers against the magnitude of the enormous coral drop-offs and endless blue abyss below. Eusebio descends into the dark depths. 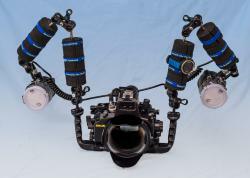 Oftentimes when shooting underwater wildlife ambient light is best, as strobes can make animals nervous and skittish. As freedivers we don’t have cumbersome or noisy scuba equipment, which means that we have the advantage of animals approaching us more closely and with greater curiosity. 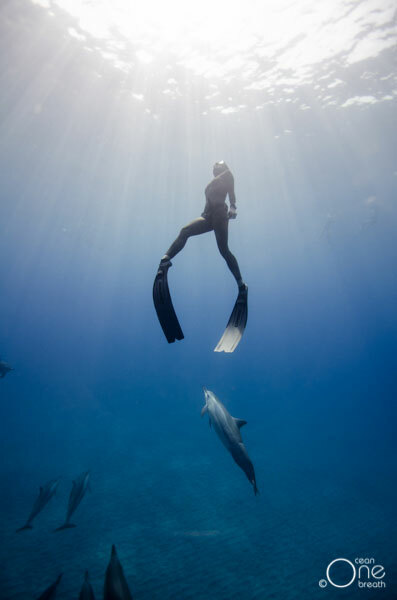 We want to encourage this natural interaction without the distraction of artificial light flashes, which is particularly pertinent when diving with sharks and dolphins. Furthermore without the drag and extra weight of strobes you are more agile in the water and can move more freely with animals who might move at a quick pace. 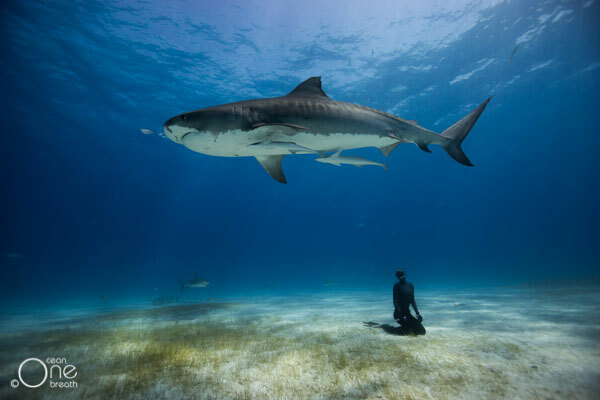 A large but shy tiger shark cruises peacefully over Christina in The Bahamas. The fast and playful spinner dolphins of Hawaii follow Christina to the surface. 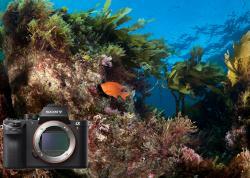 As freediving photographers, we are often taking photos from the surface down to 40 metres depth. For this reason we always white balance in the post-editing process and ensure that we are always shooting in RAW. As a scuba diver you have the time to white balance underwater, however we find that when shooting in ambient light we can white balance, retouch the tones, contrasts and exposures with more ease in post production. Furthermore, in this process you will discover that although some images look good in color, they look more striking in black and white, thus giving you the freedom to be more creative with your images. 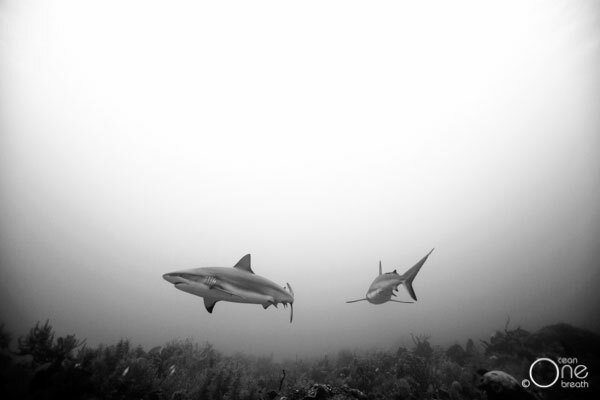 Caribbean reef sharks float in unison over the reefs of Roatan. Christina descends to the dark depths. In conclusion, sometimes the less equipment we carry the more creative we become. Our advice is to select some appropriate photo shoots to lose the strobes in order to discover a new sense of freedom and creativity by exploring the endless possibilities of natural ambient light. 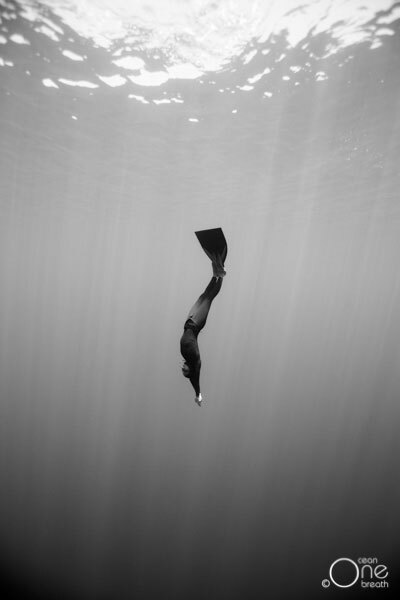 One ocean One breath’ is a creative collaboration between professional freedivers, husband and wife duo, Eusebio and Christina Saenz de Santamaria. Eusebio from Spain is the co-founder of ‘Apnea Total’, one of the world’s largest freediving education systems, and is one of the few men to have surpassed 100 metres (328 feet) in depth in the self-powered disciplines of freediving. Christina, originally from Australia, holds the record as the deepest Australian female freediver in history with dives to 82 metres (270 feet) in depth, and ranked in the top 5 deepest women in the world. When not teaching or training on their island home of Koh Tao in Thailand, they are exploring the world’s ocean on one breath with camera in hand, learning and discovering more about their passions for freediving, underwater photography and filming.